Career question: Do I really need to learn Trados? As an employer and a professor, I have often heard the question, “Do I need to learn Trados to get a job in translation?” Students regularly ask this at the start of my Introduction to CAT (Computer-Assisted Translation) course at MIIS (the Middlebury Institute of International Studies). Professionals often wonder the same, especially if they are newcomers to the industry or if they are looking to advance in their career. Perhaps you have also heard or asked the same question. Opinions vary widely. And the passion of such responses can be quite intense, as may be expected when a software program has won the largest share of users in a heavily fragmented market. Fans will enthusiastically answer “yes, Trados is the industry standard!” Opponents will staunchly object, “no!” Others may grudgingly say, “yes, Trados is a necessary evil.” Other responses in the middle are more tempered. Valid arguments are made both for and against learning Trados, and this article will review some of those. Ultimately, both logic and emotion have persuaded me to lean one particular direction. Yes, obviously not everyone uses Trados. 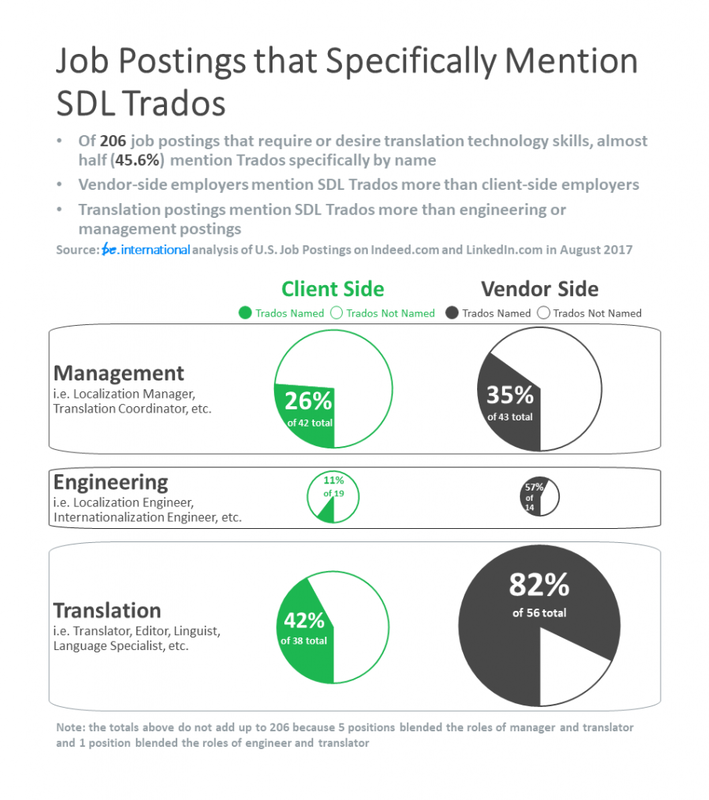 In an August 2017 analysis of 200+ U.S. job postings that required or desired translation technology skills, an impressive 45.8% of the jobs mentioned Trados, but only 22.8% named Trados as a minimum requirement. That means more than three quarters of job postings do not specifically require Trados skills. And, yes, I also agree that it is most important to learn some TEnT, no matter what it is. In fact, one of the most important learning outcomes of the introductory course I teach is to “learn how to learn” such technology. After learning one translation technology, people find it much easier to quickly learn another when necessary. For this reason, my students are required to prove that concept by learning how to use multiple tools. Similarly, when I have hired project managers, engineers, and translators to work for me, I have usually hired them based on their aptitude for learning technology and not for their skill with a specific brand of technology. Yes, Trados is not the best tool for everyone. Alternative technologies each have their own strengths. I would never say Trados is the best for every situation. Translation technology advocate Uwe Muegge has frequently written strong arguments in favor of teaching translation technology courses using cheaper, simpler, web-based tools that minimize the need for troubleshooting and allow for real-time sharing. I would also agree with most of his arguments. Similarly, in my career, I have helped my partners and employers to build new technologies that have advantages over Trados in various situations. With all those great arguments in favor of learning alternative programs, why would someone still worry about learning Trados? Uncertainty is the main concern expressed to me by students and professionals who have only learned alternative tools. Job seekers want to have multiple good options and they wonder if it will be enough to know an alternative tool when so many job opportunities mention Trados specifically. 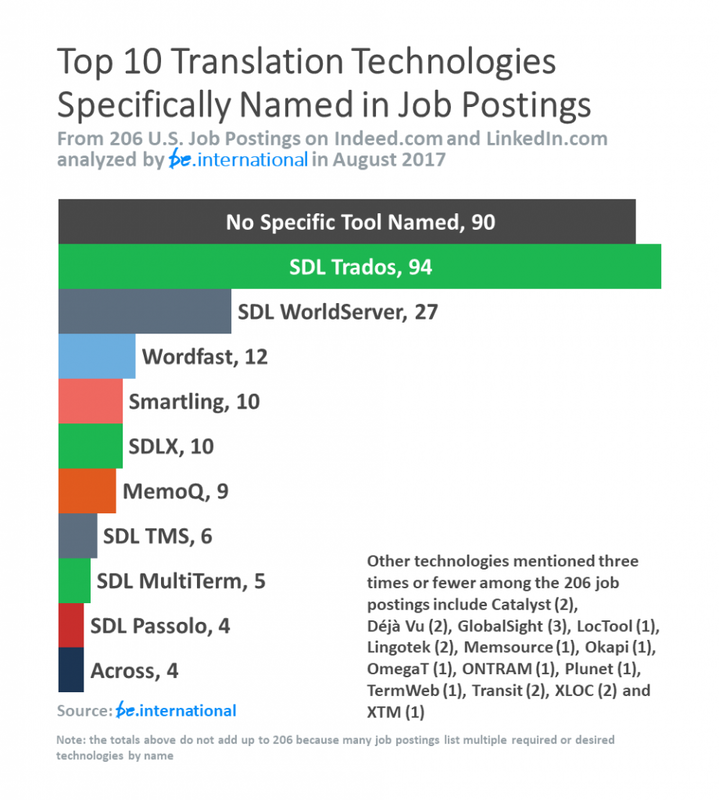 The chart below shows that current job postings mention Trados more than all other non-SDL tools combined. The numbers from this analysis are not perfect. This was not a totally random sample of jobs over an extended period, but a selection of all jobs on Indeed.com and LinkedIn.com that required or desired translation technology skills at a single point in time. The analysis did not include contacting each hiring manager to confirm if each skill was really required or desired as described in the posting. Consequently, these numbers do not account for the hiring managers who may mention Trados to describe any generic translation technology like someone in the US might mention Kleenex to describe any generic facial tissue. Regardless of the limitations of this analysis, these numbers show a very lopsided tendency for job postings to require or desire Trados skills. Anecdotally, this tendency has proven to be constant for more than a decade as industry newcomers confront a sizable number of job postings that require or desire Trados skills. Facts are crucial when deciding how to invest our time and money in technology. We should consider the fact that many companies do not use Trados while also weighing the fact that Trados is the most requested of all translation tools. We should also prioritize the relevance of facts in making these decisions. For example, to determine what tool will best help us to get a job, knowing what tool is most requested by employers — the demand side — is more important than knowing what tool is most used by employees and contractors — the supply side. Imbalance is a related issue. Hypothetically, if 1,000 Trados-using job seekers are applying for 94 Trados-mentioning jobs, but only ten Smartling-using job seekers are applying for ten Smartling-mentioning jobs, we must factor in the imbalance of supply and demand. We should also consider that percentages are different based on which specific roles and specializations we wish to pursue. The chart below shows that Trados is named very frequently by employers; however, Trados is named much more frequently in translator job postings than in translation manager job postings. However, facts are not completely independent of opinions. Emotion and perception still play roles in deciding which technologies to invest in. Logically, I can point to a majority of translation and localization jobs that do not require Trados exclusively — even if it would be “nice to have.” And most people can easily learn Trados after having mastered a similar tool. However, when looking for new or different jobs, people often feel insecure for many reasons, and job seekers can gain a significant boost of confidence by being able to state that they know how to use the market’s most-requested tool. Some feel sufficiently confident without knowing Trados, but the confidence that accompanies knowledge of Trados could make a significant difference for others. If you can afford access to Trados, give it priority, but don’t limit yourself exclusively to Trados. Many students find it easiest to first spend a day or two learning the basics of translation technology in a simpler tool like Wordfast Anywhere or Google Translator’s Toolkit. Learning basic concepts about managing translation memory, terminology, and automated quality assurance in a more streamlined tool can improve the learning curve in Trados. Then, after taking the time to master Trados, try to learn another tool for which demand is increasing, thus proving that one can learn how to learn translation technologies. If you can not afford reasonable access to Trados, learn another tool exceptionally well, and then learn Trados. Those who are in a better position to learn another tool like MemoQ, Lingotek, OmegaT, Matecat, Fluency or something else should put forth the effort to truly master it. Having mastered many translation tasks in an alternative tool, one will then find it comparatively easy to learn the same tasks in Trados using a free 30-day trial version. The answer to the question of whether to learn Trados does not need to be all or nothing. Those who follow these recommendations will have not only the confidence to say they know Trados but also the experience to affirm they can learn any similar tool in a short amount of time. Again, many people will have very successful careers in translation or localization without learning Trados; however, those who find themselves stressing about the question of whether to learn Trados should consider the demand-side numbers, the warring emotions of confidence and insecurity, and the two recommendations above.